That's it then! Turner runs two and Australia have won this one rather comfortably in the end with 13 balls and 4 wickets to spare. What an innings from the Perth batsman, playing only his second ODI! Surely a name to remember in the future. WICKET! Finally a wicket but don't think it will matter much now, Carey top edges one and it lobs in the air where Dhawan takes a simple catch. Just 2 runs required though for Australia now. They are now 357/6. 50! Turner completes a fine half-century, strike rate of 160! Deposits Bhuvneshwar Kumar into the stands behind long on before pulling one for a four. Been a sensational innings this so far from him, can he bring Australia home? What just happened there! Loud appeal by Pant, first for stumping and then for a catch behind. Third umpire is called in to check the stumping. Turner is safe there. Now, India also decide to review for catch behind. Again, the third umpire comes into play. Snico shows a spike but there is a lot of disturbance on the snickometere. The umpire stays with the onfield decision and its not out. Chahal ends with figures of 1/80 after his 10 overs! WICKET! Chahal has provided the breakthrough, outside the off stump and asking Handscomb to come and hit them. He steps forward but doesn't get it from the middle of the bat. Goes high in the air and KL Rahul takes a good catch. Handscomb departs for a well made 117. KHAWAJA SURVIVES! Kedar Jadhav has delivered for India once again or maybe not. Jadhav traps Khawaja in front of stumps, Dharmasena immediately raises his finger. Australia decide to review though, and luckily Khawaja survives, The ball would have been missing the leg-stump! Big reprieve this, can he make the most of it?! 50! Handscomb also completes his half-century now, both the batsmen playing extremely well so far. Good over as well for Australia as they pick 9 runs from that one by Chahal. They are certainly not throwing in the towel here! 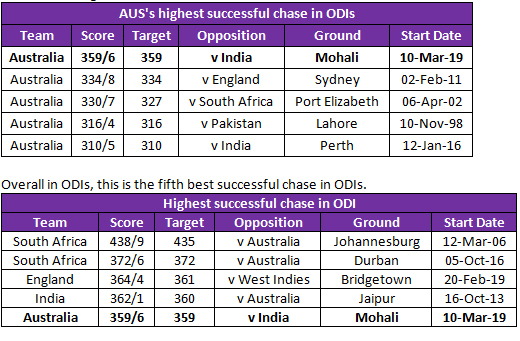 This is AUS’s highest successful chase in ODIs. SIX! Ashton Turner isn't giving up on this one yet, deposits one into the stands to ensure Australia pick 10 runs from the over despite losing a wicket. Good over for Australia this, 13 runs coming from the over as Maxwell tonks one into the stands. Dew definitely playing a part now as both spinners are struggling with gripping the ball at the moment. Australia are now 229/3 after 36 overs! Still more 144 runs required for Australia to win this one! Kuldeep Yadav has been a real threat for Australia all through the series and we can see that in the way they are tackling him. He almost gets the wicket as Khawaja looks to reverse sweep him! Ind vs Aus Latest Update and Live Score: That's it then! Turner runs two and Australia have won this one rather comfortably in the end with 13 balls and 4 wickets to spare. What an innings from the Perth batsman, playing only his second ODI! Surely a name to remember in the future. Catch all the live action from the fourth ODI between India and Australia through our blog. Preview: India have won 12 of the 13 bilateral ODI series they have played since June, 2016 – that is how ruthless and consistent they have been as a unit under Virat Kohli. After Australia pulled one back at Ranchi, India would look to seal the series in Mohali and continue their remarkable run in the format. The Indian skipper, Virat Kohli made it clear after the loss in Ranchi that though there would be some changes to the Indian XI for the remaining two ODIs – to give a few players a last chance before the squad for the World Cup is finalised – the immediate focus of the team would be to win the series. India would be concerned with the recent form of their openers – Rohit Sharma and Shikhar Dhawan. The pair have just added 487 runs in their last 17 innings at an average of 28.64 with just one hundred and one fifty run stand for the opening wicket. Of particular concern would be the form of Dhawan who has managed to accumulate just 392 runs in these 17 innings at an average of 24.50 with just two fifties in this time-frame. Ambati Rayudu hasn’t cemented his place at Number 4 either. He has aggregated just 247 runs in his last 10 innings at an average of 30.87, including just one fifty. Equally concerning has been his strike rate of 75.30 during this period, which is even lower than his career strike rate of 79.04. KL Rahul makes a strong case to get a chance in Mohali and could slot in ahead of either Dhawan as opener or Rayudu in the middle order. MS Dhoni is being rested and that opens the door for Rishabh Pant to further his case for World Cup consideration. India might also give Mohammed Shami a break after he suffered a minor leg injury in Ranchi. Bhuvneshwar Kumar could get his first game of the series as could Yuzvendra Chahal, who has so far been sitting out. On the other hand, Australia would look to draw level and take some confidence from their performance in Ranchi – it was only their 4th 300-plus total in 19 innings post 2018. The return to form of their skipper, Aaron Finch, would give Australia a huge sigh of relief. The 193-run stand with Usman Khawaja was the highest Australian partnership since 2018. This followed an 83-run opening wicket stand in Nagpur (Australia’s openers hadn’t managed to put together more than 20 for the opening wicket in the previous 7 ODIs). They would expect more from the likes of Shaun Marsh (23 runs in 2 innings) and Peter Handscomb (67 runs in 3 innings) in the middle-order. Pat Cummins and Adam Zampa have been the stand-alone bowlers for Australia in this series (7 wickets each). The Australian seamer has been outstanding – not only has he picked up crucial wickets of the Indian top-middle order but also been phenomenally restrictive conceding just 4.09 runs per over. It would be interesting to see whether Finch introduces Zampa early in Kohli’s innings – the leg-spinner has dismissed the Indian captain twice in the series already. India has played 15 ODIs in Mohali. They have won 10 and lost 5. They have won 4 of their previous 5 matches at this venue. However, they have lost their previous three encounters against Australia and only beaten them once at this ground way back in 1996 (overall record 3-1 Australia). A pleasant day is expected on Sunday. The pitch is expected to be flat with the ball coming onto the bat at a good pace and height – so expect plenty of shot-making and boundaries. There could be some dew in the evening thus it would not be surprising to see both captains wanting to chase if they win the toss.